Back to review yet another awesome product by Daeng Gi Meo Ri, I can’t help but gasped at the super duper long name of today’s hair product though.. Ja Dam Hwa The First (and that’s excluding the brand name) is a multi-function product that washes scalp and boosts hair’s vitality by using traditional Korean medicine inspired ingredients such as white ginseng and ginger. It also contains a real herb complex made of green tea, camomile, sage, Calendula and Henna, to moisturize deeply. 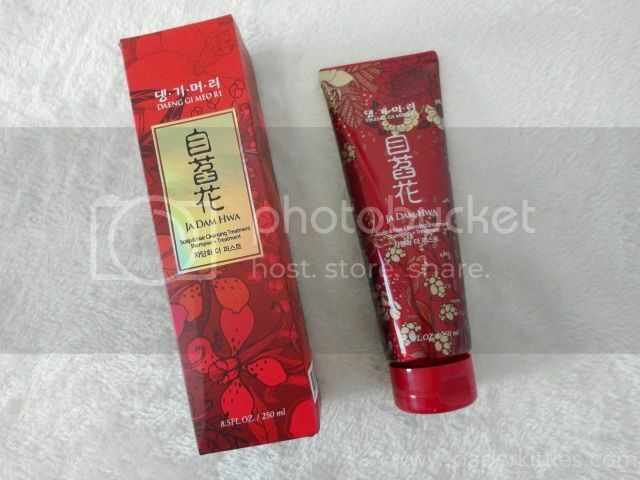 The tube contains 250 ml of the red coloured shampoo-treatmen which has a subtle wild flower fragrance. The foam created by the natural surfactant softly helps eliminate wastes on scalp, thus making Ja Dam Hwa The First both a shampoo AND a treatment – talk about killing two birds with one stone. Due to the patented (crinum lily extracts) formula, each wash rejuvenates my tired scalp and hair with energy, strength, and beauty. I like how prolonged usage has made my hair much stronger and less brittle than before, very important for someone like me who bleach my hair on a regular basis! However, I realized that whenever I use Daeng Gi Meo Ri Ja Dam Hwa The First, I always need to follow up with a conditioner as it makes my hair dry and slightly tangled. That was quite puzzling initially as I’m someone who can go without using conditioner and treatments for a long period of time. Therefore, I won’t recommend for it to be used on a daily basis; instead, rotate it among other shampoos for the optimum effect.